One of the best parts about studying abroad is the opportunity to travel to so many new countries around you. The time you spend in your host city for the semester is so special, and nothing can really beat living life in Florence for a few months, but the weekend trips sure come close. This really is a fantastic opportunity since everything is so much closer than it ever would be from The States, but let’s be real, travel is still really expensive. After going on a number of weekend trips, I think I’ve become slightly qualified to give some tips on how to get the most of your experience with the least of your money. 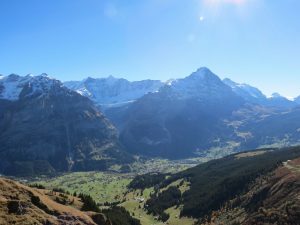 The views of Switzerland were well worth the food money sacrifice. Ok, so this one is probably pretty obvious. Generally, transportation and accommodation costs are lower if you book them well in advance. I know it’s super fun to take a spontaneous trip somewhere, but I would try to leave that for the day trips you’re bound to make. The longer trips should really be planned and booked ahead of time to save money. Not only will it be cheaper, but you’ll have more options to explore since most hostels and tickets will have more spots open the further in advance you book. That, and having everything taken care of in advance really takes away the headache of figuring things out once you get somewhere. Speaking of spontaneity and day trips, you should definitely do this. It’s so tempting to explore a ton of different countries while you’re in Europe. I mean, why not? This is probably the time in your life when it’ll be the cheapest for you! But let’s not forget that a weekend trip to a different country always costs at least $200. A day trip? Those can easily be around $50. Day trips are easier to plan, cheaper, and they give you the chance to experience the cities or towns around your host city. One of my favorite trips this semester was a day trip to Verona. The town was so cute, the weather was perfect, and my four cheese pizza from a trattoria was honestly the best pizza I’ve had in Italy so far. The round trip train tickets were about $40, the pizza and wine were around $10. 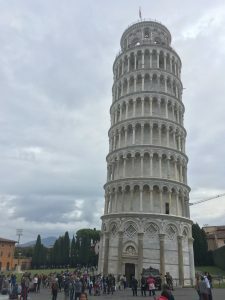 Another great day trip I took was to Pisa! Great sights, not a lot of money! So planes and trains are pretty great. The fares are almost always cheaper here than in the US, mainly because of the proximity and overall better transcontinental public transportation. But the absolute cheapest way to get around? Definitely a coach. Sure, buses take the longest to get somewhere, but the amount you save and the views from the windows will make it worthwhile. And here’s an even cooler thing: if you take an overnight bus, then you just saved on one night of accommodation. Maybe sleeping on the bus isn’t the most comfortable thing, but plug in some headphones, take some melatonin, and you’ll be out and ready to explore the new town you just found yourself in the next morning. 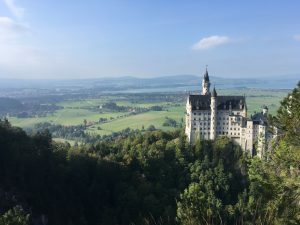 Used German public transportation to get to some cool places, like the Neuschwanstein Castle! As humans, we kind of need to eat. Although experiencing new foods from different cultures is a worthwhile experience, the cost of eating out can add up really quickly. You don’t have to sacrifice the experience of trying new food though! The best way to save on food is to find accommodations that include breakfast (a lot of cheap hostels do), pack for a few lunches and dinners, and chose the meals that you’re willing to splurge on. For example, Switzerland is a very expensive place to buy meals. You can find a Margherita pizza there for about $12-$16. Yikes. When a few friends and I visited Switzerland, one of our first stops was the grocery store. We all bought our own bread, peanut butter, and snacks for lunches, and then we split the cost of pasta and veggies for making group dinners. I personally spent about $10 for enough food to make lunch for four days. After splitting the cost of two nights’ worth of dinner for 7 people, each of our plates cost us about $1.50. We didn’t want to miss out on the Swiss fun though, so we collectively decided to splurge one night on traditional cheese and chocolate fondue. The fondue was definitely worth the money. 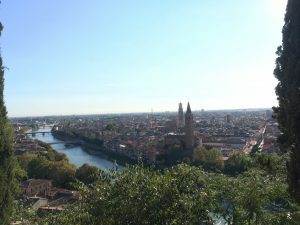 The day trip to Verona was one of my favorites so far! While traveling in Europe, you’ll find that hostels are usually really cheap and great places to stay. Sometimes popular spots will have some higher prices though. And who knows! You might not be the type for the hostel environment. After all, it’s a lot of young people sharing a room with up to 18 people. And a lot of hostels are also pretty great party spots for the night. If you’re looking for a quieter, less touristy, and sometimes even cheaper experience, Airbnb might be the way to go. After splitting the costs of some Airbnbs, you might even find a better deal than a hostel. And this way, you’ll get the chance to experience staying in a local home of the city that you’re visiting. A lot of these homes are further away from major cities, but Europe is generally better about public transportation, so it’s usually perfectly fine! Metro passes also got us to the city center of Munich. So many great things to see! Speaking of public transportation: this also costs money! Although individual trips are generally pretty cheap, if you’re visiting a bigger city, you’ll need to use the metro several times in one day. Most cities have several-day passes, or even group passes that’ll help you save if you know for sure that you’ll be using them frequently. 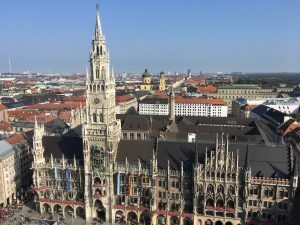 When I went to Oktoberfest with a few friends, we split a three-day group pass because we knew that we’d have to travel at least 30 minutes from our accommodations to the Munich city center every day. And even then, we knew we wanted to visit other spots in the city as well. Splitting it four ways cost us about $13 for the whole three days. If each individual trip cost about $1.50, I think my total for the weekend would have been at least $25. Hopefully, these tips helped out a little. I know that, personally, I was constantly looking up something to the effect of: “tips for study abroad” or “money saving tips in Europe” before I got here. Those few lists that I saw online, the tips I’ve gotten from people here, and the experiences I’ve had sure helped me a lot. I hope the same goes for you! Happy travels! Katie is a fall 2018 SAI Florence student from Clemson University.